Exposure compensation (also known as Exposure Control), is used to alter exposure from the values chosen by the camera. Often a composition has widely varying intensities of light. To get a good exposure in these tricky situations, don’t use the histogram (which shows the distribution range of pixels from black to white) but rather look at the highlight warning alerts- the “blinkies”. Any area which is blinking shows it is so severely overexposed there is no detail. 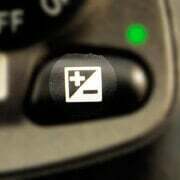 Use this button to override the camera’s exposure by darkening the exposure a bit until the detail returns. Push the button down and rotate the main wheel to reduce the exposure. PS: shutter speed and aperture don’t change. Hi, I’m a photography student from Argentina. In class we’ve been talking about exposure compensation and I don’t quiet understand how the camera changes the exposure (when we use exposure compensation) without changing the shutter speed or the selected aperture. Thanks for your answer and for the content on your site. It’s a big help for newbies like me. On a Nikon in Manual mode, Exposure Compensation will not change shutter or aperture, but will change the meter reading (-2 EC will shift the meter to read +2.) In truth, all EC does is shift the meter one way or the other. The camera will then react to the new meter reading as it normally would. Exposure compensation can adjust shutter speed, aperture, ISO, or a combination of the three depending on the exposure mode selected. The thing to remember is that exposure meters, whether hand held on in the camera, want to adjust the exposure for an 18% (or 12% or similar depending on who you ask or where you look) gray. What does that mean? Well, it means that the average scene wants to reflect 18% of the light available. It is a good average. However, how much light does a snowy hill reflect? A lot more than 18%. So, if you expose snow, without benefit of exposure compensation, you end up with grey snow. Now, you all know you have done that and seen grey snow; Right? So, to get white snow you need to turn up the exposure a stop and a half or so. The camera will think it is over exposing, but being an obedient robot; it will just go ahead and give you white snow. This example is really quite over simplified. It does not touch on matrix metering or center weighted or spot metering. Each of these special kinds of exposure metering just tailors the area the camera will try to adjust to a boring 18% gray. Bye the way. Ever see an 18% gray card at your local camera store? Those cards are designed to reflect 18% of the incident light. So, if you point your camera at one of those cards and force you camera to use the exposure it finds for that card, you should get good exposure for whatever you place in the same place you had the card. I am a beginner in photopgraphy. What do you mean by turning up exposure a stop and a half? I’m confused, does this apply to digital photography? I have never seen gray snow. I’ve seen yellow and black snow, though.